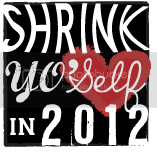 I accidentally dropped out of the Sisterhood’s Shrink Yo’Self challenge, but I haven’t actually gone anywhere. Well, I *did* get off-track over the past couple of weeks, but I’m back on track, and shrinking again. First, I talked my husband into doing Weight Watchers Online with me for three months. I don’t think he needs to lose weight, certainly not like I do, but I wanted to get him involved so that he would be better at helping me – this way he knows the plan, knows what I’m up against, and can help plan dinners and snacks around the house. I’ve been “on plan” since Saturday, and so far so good. I’m down a little since then (though it might mostly be water weight…we won’t mention that), and so far don’t really feel deprived at all. I *know* how I’m supposed to be eating, I wanted to start the program to give me a little structure and accountability. Now I just need to stick with it….I’ve committed to 3 months (translation: I’ve *paid* for 3 months), so keep me honest for at least that long, ‘k? I’m still exercising – meeting with my personal trainer for an hour twice a week (except this week, since a migraine struck yesterday). Plus, still getting out and doing my own version of c25k. I’ve found that jumping from a couple of 10-minute intervals straight into a 20-minute interval is just not working for me. So…I stepped back to 8-minute intervals, and will do those for a couple more runs, then will gradually step that up, minute-by-minute. I might just be a runner who *needs* a walk break now and then to push through each run interval. We’ll see. But, I’m not giving up!